Heavy-hearted, Sophronius, the patriarch of Jerusalem, set out to meet the Caliph, the successor to the Muslim prophet Muhammad, at the gates of the Holy City. The surrender had already been negotiated, after a siege that had lasted four months. Sophronius, patriarch of the city since 634, had decided that the city must be surrendered. For several years, Palestine had been cut off from the rest of Christian-Byzantine territory. Sophronius could have known nothing of Emperor Heraclius’s intentions to relieve or leave the city to its fate. He did know that invaders had ransacked villages of Palestine for the second time in a generation. That terror certainly encouraged him to accept surrender in exchange for the lives of the Jerusalemites and the safety of its churches. In the meantime, he sent many of the city’s precious relics, including the True Cross, to Constantinople, where they could be kept safe. Shortly after the capitulation of the city, Sophronius seems to have fled into a voluntary exile. He died shortly thereafter, sometime in 638, many said of a broken heart. Sophronius lived in a religiously and politically tumultuous era. Violence between Monophysite and Chalcedonian Christians often erupted in the great cities of Antioch and Alexandria. These two rival groups had been at odds since the fifth century, when oriental Christians began to insist on the one nature in the incarnate Christ, in opposition to the teaching of the Council of Chalcedon in 451, which taught two natures in Christ, one fully divine and the other fully human. In addition to this religious strife, Byzantine politics destabilized, and made the empire vulnerable to invasion from Persia, the Roman Empire’s age-old enemy. In 602, a bloody coup in the palace in Constantinople ushered in a decade of terror and instability, which the Persians used to conquer Egypt, Syria, and Palestine, all of which remained in Sassanid hands for a generation. Sophronius was born sometime around 560 in Damascus, but was formed by the Christianity of Palestine. Great monastic and liturgical creativity flourished in Christ’s homeland during the sixth century. Still to be seen today are the remnants of numerous lavra, the cliff monasteries in the Judean countryside, some of which are still living communities. Lavra monasticism sought to combine the eremitic and cenobitic observations of monasticism. Between the hours of communal worship, when the monks gathered in church for the celebration of the Office, they remained in solitary prayer in cells bored out of the cliffsides of the Judean desert. 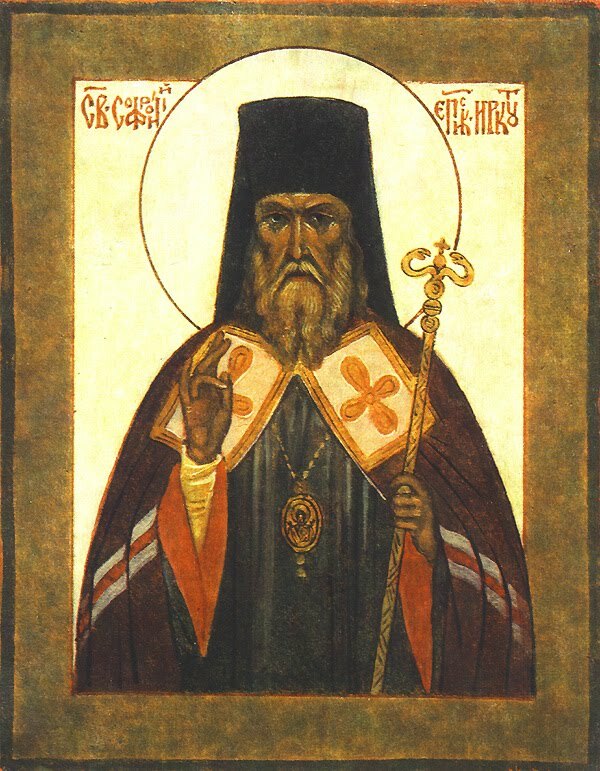 Sophronius joined the lavra of St. Chariton, where he became the disciple and friend of the spiritual master John Moschus. In 604, the two monks left St. Chariton to travel throughout Egypt, where they studied monasticism in its homeland. They became advisors to the patriarch of Alexandria, who in 607 encouraged them to gather the lore of the desert fathers. John Moschus collected these in his The Spiritual Meadow, a catalogue of the lives and deeds of mostly Middle Eastern holy men. Some of Sophronius’s own works survive; they clearly influenced the thought of the most creative of the later Fathers, Maximus the Confessor (died 662). All three of these great figures emphasized deification—the divinization and glorification of humanity by the grace and glory of God. Upheaval in the imperial capital must have contributed to their decision to leave Egypt for Rome. In 602, a general named Phokas deposed and executed the Emperor Maurice. Phokas was a cruel, bloodthirsty tyrant whose rule amounted to a reign of terror. In 610, a general from Africa named Heraclius gathered an army and deposed and executed Phokas. The political instability proved a catastrophe, for the Sassanid Persians took advantage and seized the regions of Syria, Palestine, and Egypt from Byzantine control. Persecution of Christianity accompanied the military campaign, for the Persians slaughtered lay and clerical Christians, and destroyed numerous churches. They took Jerusalem’s most precious relic, the True Cross, off to Mesopotamia. Many Byzantine-Christians fled to the west. Like many other refugees of the religious and political tumult of the east, Sophronius and Moschus found sanctuary in Rome. Christian worship in the east was badly damaged, and the length of the Persian occupation (about 15 years) meant that many of the young grew up knowing little of Christian faith or liturgy. Heraclius, however, rallied Byzantine forces and had decisively defeated the Persians by 628. Sophronius returned to Palestine and was named patriarch of the city in 634. The True Cross returned to Jerusalem amid triumphal rejoicing. Still, Byzantine political and religious authorities faced a colossal task. Both government and church desperately needed time to be reconstructed. Alas, that time was not forthcoming. Muhammad himself had planned on a campaign against Christian Syria and Palestine, but when he saw Heraclius’s armies decided to bide his time. In the meantime he died, but his successor Umar waged a campaign of conquest in fulfillment of Muhammad’s ambitions. The great battle of the Yarmuk river in 636 spelled the doom of Christian government in the Levantine regions. The Byzantine army was utterly destroyed. The Persian and Muslim wars, coming as they did in quick succession, had exhausted the Byzantine Empire’s military resources. Heraclius, who lived until 641, could do nothing to recover what had just been recovered. He spent the rest of his days broken hearted, having seen his great reconquests lost. The feast of Saint Sophronius is observed on March 11, but it is also fitting to remember his struggles on July 15, the date of the reconquest of Jerusalem by the First Crusade.